Let us follow the project life cycle of a classical project, like the construction of a house, from the very beginning to the very end, and look at it from a generic point of view. like last touch-ups, documentation, etc. is still to be done. We summarize this in the following graphic, emphasizing major milestones in red color. 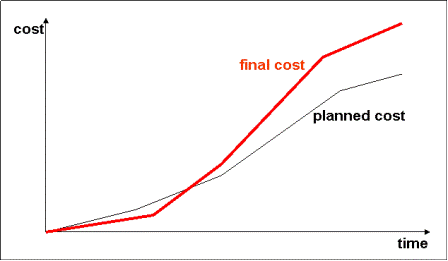 Looking closer at the project budget or cost, we observe in most real life projects that we end up with a (much) higher final cost than originally planned before contract signatures. Insufficient plans, because we want to save time and effort for planning in order to quickly start the "real work". Necessary changes to the original design or project plan, due to unexpected events after contract signatures.